Airlines and booking websites are the two segments investing most heavily in mobile advertising while the drive to increase site/mobile traffic is almost double in travel compared to other industries. Mobile currently accounts for 12% of total digital advertising spend in the travel vertical and is increasing, according to eMarketer. The majority of mobile travel consumers are male and aged between 25-44 while the number of travel consumers in the 25-34 age range is double, in percentage terms, of the total mobile audience in the same age range. Here, ‘travel audience’ is defined as consumers who frequently engage with travel content and advertisements via mobile devices. More than 90% of this mobile travel audience owns a smartphone (compared to 65% overall), while 51% owns a tablet (compared to 33% overall). This device ownership also correlates with the average household income, as 61% of the mobile travel audience earns more than $60,000 a year, compared to 58% of the total mobile audience. Travel consumers are spending more of their time across multiple devices to engage in mobile activities. The preference to use PC for travel-related activities increases with age although the 55+ years group are the highest smartphone and tablet users. Interestingly, 18-24 year-olds spend the least amount of time in travel content but still make up one of the highest percentages of time spent when compared to other age groups. On average, travel content is consumed on mobile devices for about 32-33% of the time. When it comes to the location where the mobile travel audience performs travel-related activities on mobile, ‘home’ leads the chart by a huge margin – 61% of mobile and 70% of the tablet audience research or book travel when at home. In addition, 33% of mobile and 22% of tablet audience research or book travel while they are travelling. It’s interesting to observe that, except at home, the usage of mobile phones is higher in all other locations – at work, at a hotel, at the airport, in the destination city, etc. Tablet usage is high only when the consumers are at home. Apart from the audience using their mobile devices for research activities such as discovering new destinations or looking up flight and hotel options, they also use their devices while traveling for directions, recommendations and information in a new or unfamiliar location. When it comes to travel research, the hospitality segment leads others as the top activity performed by 83% of mobile (and 74% of tablet) users. 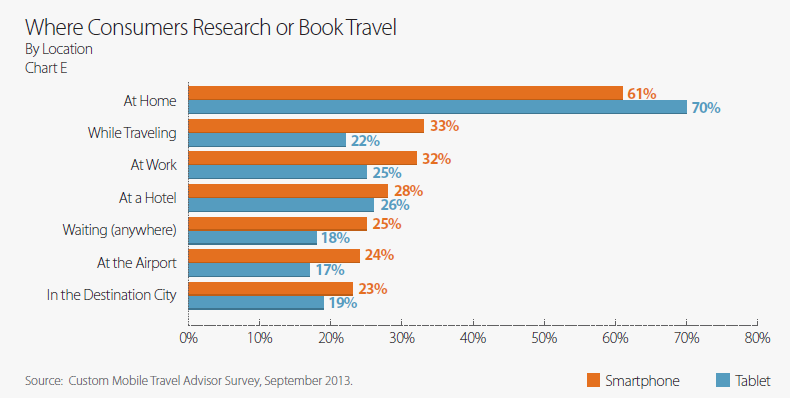 The other popular travel research segments are flights and car rental. When compared to the research performed on a train, bus, cruise and package deals, research on hotels is about four times greater. It should also be noted that smartphones overtake tablets in all segments of research although the percentage difference between the devices is minimal. When it comes to making travel purchases, two-thirds use mobile devices to make hotel reservations, while making flight reservations is the second most common activity on either device, done by nearly half of travellers. 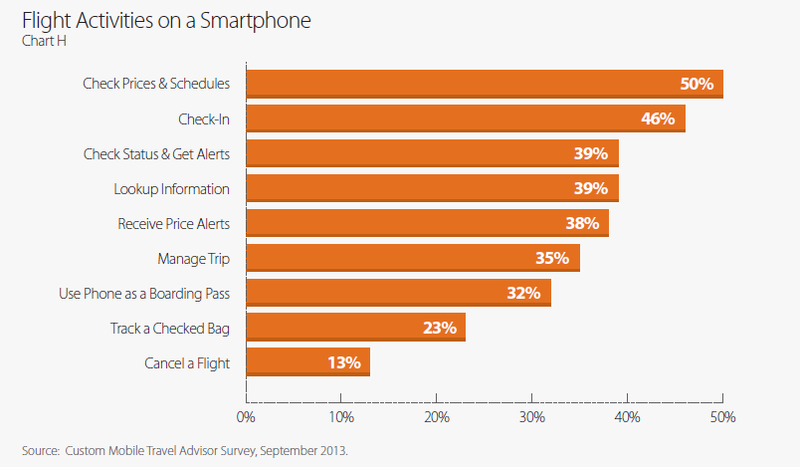 67% of travelers research flights on their mobile devices, while 49% purchase flights on mobile. Hotel and flight emerge as the two most popular travel activities on mobile. For flights, the top activities the mobile travel audience performs include – checking fare, checking status/schedule, check-in and getting alerts. For hotels, checking price and availability are the top activities carried out on mobile. Other popular activities include looking up an address/direction, reading reviews and retrieving confirmation number. via Mobile travel marketing deep dive – devices, campaign strategy, spend and more. This entry was posted in CMOs in Travel, Digital Marketing and tagged Audience measurement, comScore, Millennial Media, Mobile advertising, Mobile device, Mobile phone, Travel by Jemma Neethling. Bookmark the permalink.